The Association now has access to the ‘sketchup’ computer model, developed for the Imperial West project by their consultants Miller Hare. A couple of views created by this model are below. We think that they confirm our worst fears, and also demonstrate that the versions published by the Association in summer 2011 were a good deal more accurate than those used by the GLA and by Imperial in earlier rounds of public consultation. A third image is reproduced from the leaflet circulated by Woodlands Area Residents. As feared the development will overshadow parts of the St Quintins Estate. Houses and gardens at the western end of Oxford Gardens, and the southern end of Highlever Road, will be badly affected. The map below (reproduced from the Environmental Statement submitted by the applicants) show the shadow cast at 17.00 on 21 March or 21 September (the midpoint between summer and winter). A Highlever Road resident who raised this issue with Quattro PR has been told that the new development ‘will cast shadows from about 4pm. Of course the shadows will be longer during the winter period (although fainter in winter) and shorter in summer as the height of the sun varies. The transient nature of the sun path means that shadows cast will be temporary’. Local residents who have bought or converted the houses that will be affected, creating rooms or conservatories opening on to their gardens, might have expected to be able to return from work to some evening sunlight. Conservation areas are meant to be protected from having 35 storey towers built next to them. 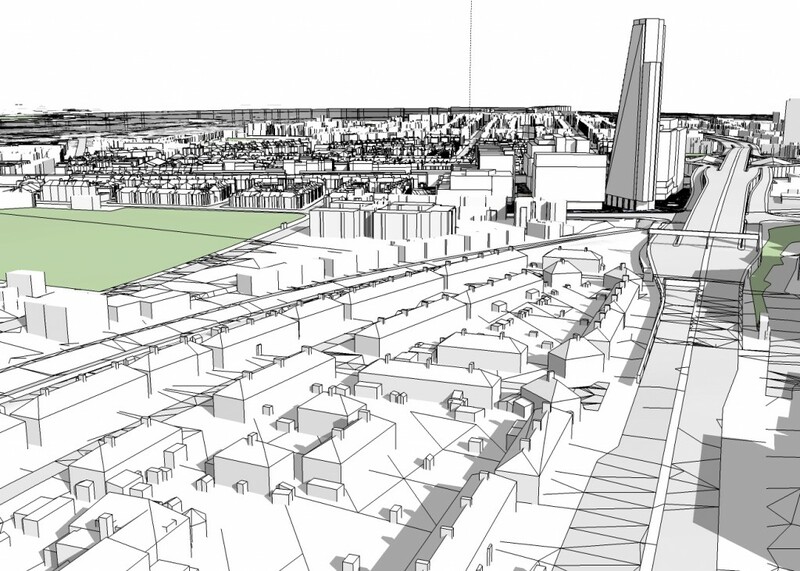 The 2004 version of the White City OAPF had a restriction on tall buildings north of the A40 Westway, to respect the low-rise housing in the Eynham Road area and on the St Quintin Estate. Nothing in the physical geography of the area has changed since. It is only the planning policies of Hammersmith & Fulham Council (and to an extent the GLA) that have changed, in their willingness to bow down before commercial developers. For the Phase 2 planning application, Miller Hare (consultants to Imperial) have prepared a series of visualisations from specified viewing points around the site. These form part of the Environmental Impact Statement. A copy can be downloaded here (warning – this is a large file). These are ‘validated’ assessments, i.e. treated as accurate by planning officers when considering the planning application. We believe these images have been taken with an approx 20mm lens which is wide-angle, rather than a 50mm lens which shows what the human eye sees. Hence distant objects appear relatively small in the frame. They are also based on images taken in summer, when street trees will obscure parts of the development from different viewing points. The views of the development from the streets and houses that surround the Woodlands site, have been a key area of controversy between local residents and Imperial. We challenged the accuracy of the ‘visualisations’ and photo-images of the Phase 1 blocks. The Association produced its own version, which has proved to be much more accurate (as can be seen by looking at the blocks, now built, from Kelfield Gardens). 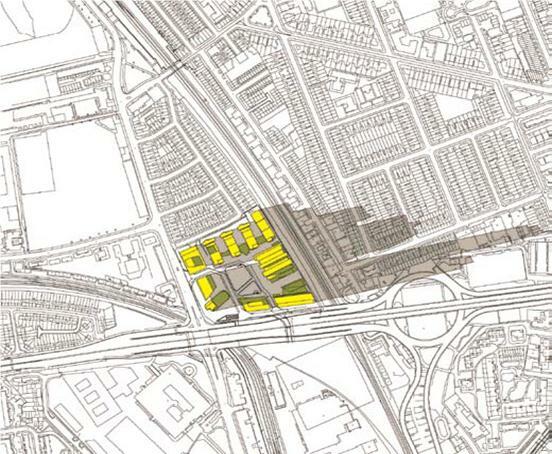 When planning Phase 1, Imperial’s architects took account of the Eynham Road area of housing to the north of the site. This resulted in the ‘stepped-back’ design of the four postgraduate blocks, facing onto Shinfield Street and rising from 3 to 10 stories. Little thought seems to have been given to potential views from the Oxford Gardens Conservation Area. As a result, this area will be presented with a clumsy and unarticulated side view of these Phase 1 blocks. The Environmental Statement submitted with the Phase 1 application maintained that there would be little impact on views from the conservation area. The ’before and after’ visual assessments showed a set of three views taken at points along Oxford Gardens. Not surprisingly, these showed an unchanged view. This is because the Phase 1 blocks are not visible from Oxford Gardens (since they are built on the northern part of the Woodlands site). But they are very visible from the next street 120m away, Kelfield Gardens. The St Helens Residents Association, many local residents, and the Hammersmith Society all questioned the validity of the Phase 1 visual assessments in 2010, when objecting to the planning application. The committee report stated that the views were valid. This ignores the fact that the images were taken from irrelevant viewing points, in the wrong street, in the first place. 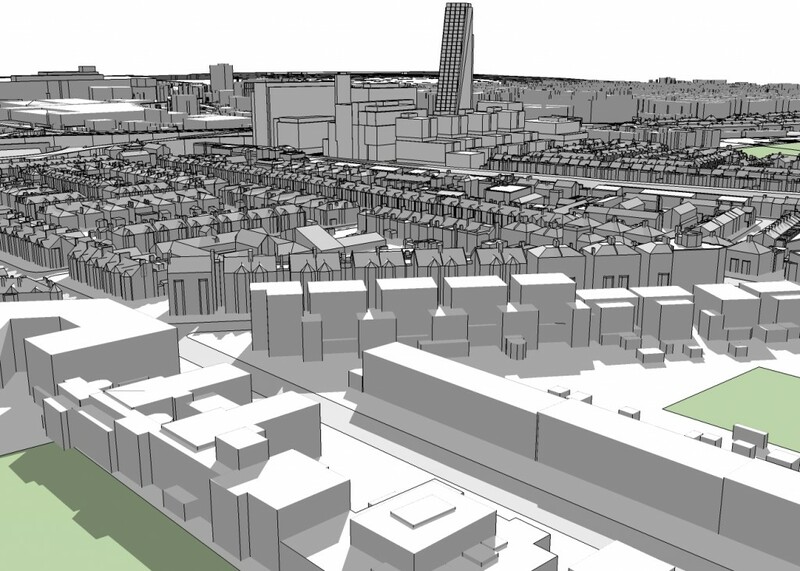 The second occasion when residents questioned the accuracy of ‘visualisations’ was at the public meeting at St Helens Church in June 2011, when the GLA presented slides as part of their consultation on the White City Opportunity Area Planning Framework (OAPF). For people living in the neighbouring streets, the slides purporting to show the impact of a cluster of tall buildings at the Woodlands site bore no relation to reality. The Association responded by preparing its own computer-modelled version of the impact of the OAPF proposals. These images were circulated to local MPS, GLA members, the Borough Council, English Heritage, CABE, and local amenity societies. At the October 2011 consultation sessions, Imperial and its architects have presented visualisations of completed development. Again, the St Helens Residents Association has found it necessary to challenge these as misleading, as a result of use of wide-angle lenses and inaccurate transposition of ‘new’ buildings onto photographs of existing streets. We should not have had to point these things out, given the past history of inaccurate visual images being used. We have stressed to Imperial that their actions have reduced public confidence in what they are saying, and have bred cynicism and distrust of the planning process. The fact that their October 2011 consultation leaflet, delivered to local households, made no mention of the height of proposed buildings had the same effect. Looks great to me; hopefully it will encourage more taller buildings. Perhaps if we could build taller building in London, without the influence of NIMBYs, normal people would be able to afford a decent place to live. I am fine with the tapered shape of the tower but the height is absolutely outrageous. They should also consider moving both the tower and building D from the western edge of the development to the eastern edge as that would at least have the effect of putting it slightly further back from the St. Quentin area. The courtyard in the middle will always be in shade and won’t be an attractive area so I would get rid of it in favour of reducing the height of the tower, which is clearly quite out of keeping with the surroundings. This development is of a density that will create enormous congestion in the area. It needs to be reduced. 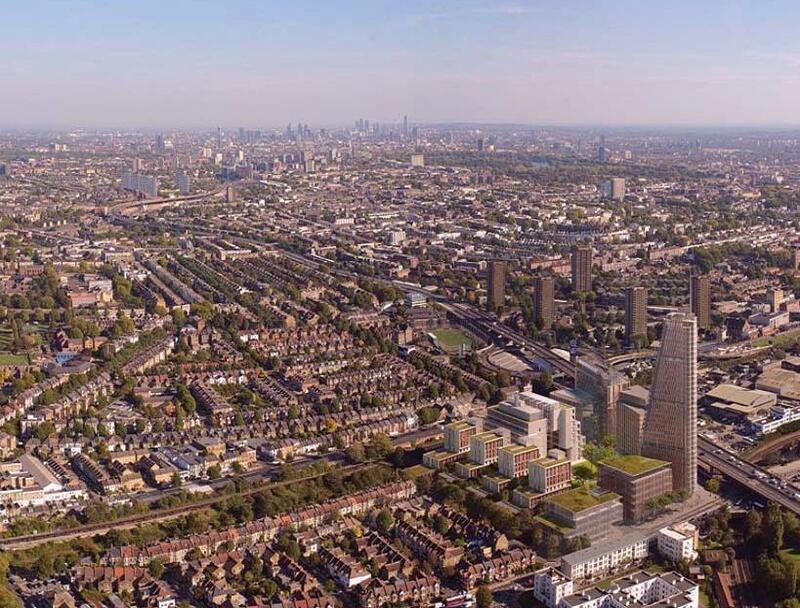 Have they even said what the 2 buildings are to be for on Wood Lane depicted on the aerial picture with green roofs? It is nonsense to give permission without even knowing what these are designated for! Got to say having studied the documents that it’s not really the tower that’s the problem in my opinion. Rather the massive bulk of Building D (Technology Transfer Building) and neighbouring bulky blocks which create almost a solid wall effect from many angles. The tower tapers as it rises and will have quite a slim minimal impression when viewed from a distance. However if you live in the shadow of Building D the impact of overshadowing will be more pronounced and last for a longer duration of time. Thes are the buildings that will impact most on neighbouring residents and need reducing. We were mis-sold the idea that Phase 1 of Imperial West would not be seen from our area, as it looms above the houses it is a stark reminder that more is to come if we don’t get Imperial to change its plans for Phase 2. One huge tower will house as many people as two smaller ones, but will cost much, much less to build: the greed of developers is dictating every aspect of these proposals. I strongly object to a building of 34 storeys bordering on a RBKC Conservation Area where the streets consist of domestic houses on the St Quintin Estate. It is quite unreasonable to consider such a building in this residential area. I am also concerned about the impact on local traffic with an extra 2000 people being housed here. I am in total opposition to the height of the proposed towers in the final phase. I am also concerned at the increased traffic congestion that the extra 250+ cars will bring to Wood Lane and surrounding areas. I would rather see the green space in the middle of the site go and the height of the buildings significantly reduced by putting two buildings there instead of one. Furthermore, if this 30+ level tower is approved, I fear it will pave the way for even higher towers (Aviva application), completely destroying the character of the area (as well as being an eye sore).